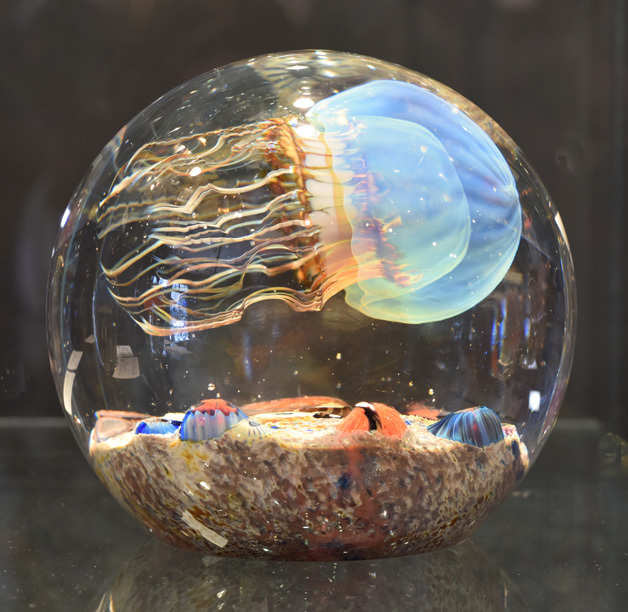 Sculpture size: 5.5" X 5.5" X 5.5"
Like the other Moon jellyfish this particular jellyfish sculpture has a beautiful ethereal translucent dome, but with the added feature of being ribbed which gives the illusion of it swimming forward. Under the dome is a brown and gold band with an array of colorful tendrils descending from within. This design has the Jellyfish floating over a beautiful seascape bottom covered with algae and amazingly detailed sea anemones. This all in a shape almost twice the size of our standard side swimmer, making every feature stand out in greater detail. Each original handmade sculpture is a one of a kind piece. No two sculptures are alike.